Ten World Food Programme (WFP) trucks, with two containers each, traveled from El Fasher to Shangil Tobaya to deliver 350 metric tons of food (oil and sorghum) to the Nifasha and Shaddad camps for Internally Displaced Persons (IDPs). The road trip took more than 8 hours due to difficult road conditions and security challenges for the convoy, which was protected by Ethiopian and Rwandan troops from the African Union-United Nations Hybrid Operation in Darfur (UNAMID). 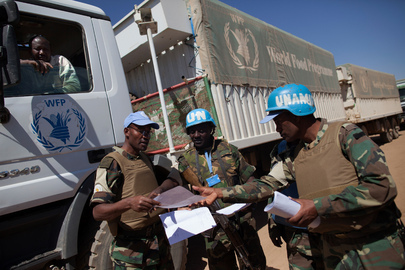 UNAMID officers exchange duties in Tabit, North Darfur, while escorting a convoy of WFP trucks traveling from El Fasher to Shangil Tobaya.